For the last year, Rachel has been living in Johannesburg, learning the Afrikaans language. Many of her new friends are French, and she enthusiastically embraces French culture. Rachel remains an imperialist sympathizer at heart. This is shown even in her choice of language—she never bothers to learn the language of Kilanga, but embraces Afrikaans, a form of Dutch that’s spoken in South Africa. Rachel goes back to explain how she came to be in South Africa. She’s now living with Eeben Axelroot, although she’s technically not married to him. Axelroot isn’t a particularly loyal companion—in fact, he sometimes ogles other women. Axelroot works for a mining company. They live together in a fairly large, comfortable house. Axelroot has been a talented pilot and a good diamond trader, meaning that he has no problem providing for his new wife. Rachel embraces her new life in South Africa—she treats it as a way to “start over.” She often thinks that she must have “done something right,” as she didn’t die in the Congo, like Ruth May, after all. Rachel is a survivor above all else: she’s always looking out for herself, even if doing so endangers other people. So she’s perfectly happy to run off with Axelroot. She has few opinions about Axelroot’s politics; all she cares about is that Axelroot can provide for her. It’s especially gruesome that Rachel can talk about her sister’s death in such Darwinian terms: she acts like she was the “fitter” sister, while Ruth May died because she was weak. Rachel may be childish and immature, but she’s also developed a lot in the last few years. She once naively believed that Axelroot was loyal to her, and would return to the Congo one day. Now, she’s realistic enough to recognize Axelroot’s nature. Rachel has become harsh and cynical in her thinking: she thinks of other people as means to an end, everyone competing with each other in their greed. In other words, Rachel has learned to see the world in the same way that Axelroot sees it. Arn, Jackson. "The Poisonwood Bible Book 5, Chapter 64." LitCharts. LitCharts LLC, 29 Jun 2016. Web. 22 Apr 2019. Arn, Jackson. "The Poisonwood Bible Book 5, Chapter 64." LitCharts LLC, June 29, 2016. 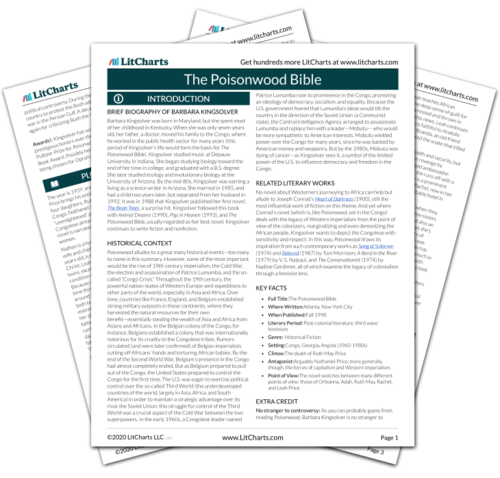 Retrieved April 22, 2019. https://www.litcharts.com/lit/the-poisonwood-bible/book-5-chapter-64.